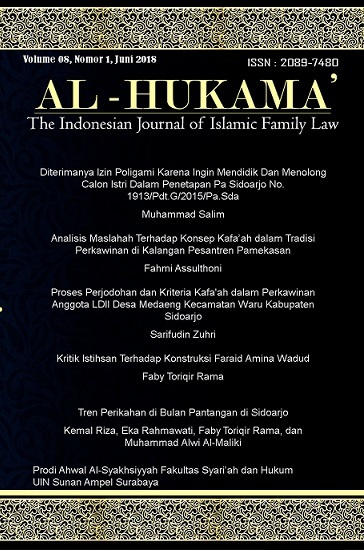 This article is a normative study of the determination of the Sidoarjo Religious Court in case No.1913 / Pdt.G / 2015 / PA. regarding the receipt of a polygamy permit application because the husband wants to educate and help the second prospective wives. This study is interesting considering that this reason is not at all listed in Law No. 1 of 1974 concerning marriage. The judge has three considerations. First, the condition of the applicant's second wife is mentally traumatized because she has experienced domestic violence in a previous marriage. second, in the Koran are required only fair. Third, there has been an agreement from the first wife, fulfilled materially and non materially by the applicant and able to be fair by making a statement. Even though the judge ignored the law in this matter, however, the value of benefit would be greater if he received the polygamy permit application. The judge may give a different verdict, but if it continues to do so the limitation of polygamy regulations will be weak. What did the judges were in accordance with article 4, paragraph 2 of Law No. 1 of 1974 and Law No. 48 Year 2009 concerning Judicial Authority Article 1 Paragraph 1. Al-Hukama' oleh http://alhukama.uinsby.ac.id/index.php/alhukama/index disebarluaskan di bawah Lisensi Creative Commons Atribusi-BerbagiSerupa 4.0 Internasional.